Due to the embargo, it is understandable that there are very few cars newer than the 1950’s on the road in Cuba today. The lack of international trade has inadvertently created a fascinating culture of innovation in Cuba. When you see the hodgepodge of Russian and Chinese parts under the hood of your cab driver’s 1950’s Chevy, you’ll know exactly what I mean. In addition to the classic cars, Cuba is full of relics from yesteryear. For example, very few of the buildings in Cuba were built after 1959 revolution. 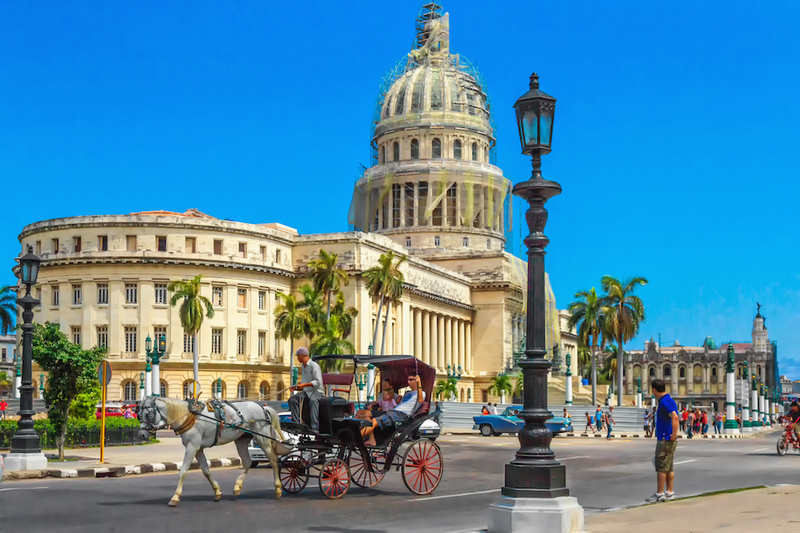 Walk the streets of Old Havana and you’ll notice the history right away. Another factor that greatly contributes to the feeling that you’re stepping back in time when you visit Cuba is the lack of Internet connectivity. Very few in Cuba have access to the Internet at home, and the only options for foreigners and Cubans alike to connect to Wi-Fi are certain hotels and a few dozen outdoor hotspots in parks across the country. Furthermore, Wi-Fi access and cellular usage are expensive for most Cubans. While a life with little to no cell phone and Internet connection might sound frightening to an American who spends most of their day glued to a computer or phone screen, the lack of connectivity in Cuba actually ends up being a much-welcomed respite to most visitors. Don’t you remember what it was like when your only source of entertainment was the landline that you used to chat up a storm with friends, or that old antenna television? Imagine that!